Type T hydraulic comparator (System F) is a self-contained high volume pressure source capable of producing pressure up to 15 000 psi. 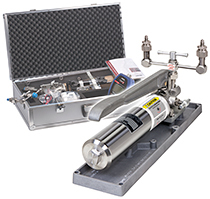 It is ideal for testing gauges and setting hydraulic relief valves and pressure switches. Multiple models are available for hydraulic oil, water, or both. For details on pump models and complete pump systems, click on the Options tab.